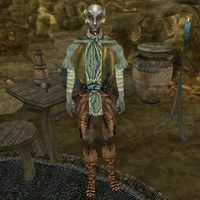 Threvul Serethi is a Dunmer healer who has a shop in Sadrith Mora, where he sells ingredients, potions, and spells to all who need them (you do not need to be a member of House Telvanni, though you will receive a discount). Threvul is a restocking vendor of the following ingredients: Bittergreen Petals, Corprus Weepings, Hound Meat, Netch Leather, Scrib Jelly, Scuttle, Small Kwama Egg, and Wickwheat. Additionally, he owns three Violet Coprinus which grow in his shop. These will also restock, but only after the mushrooms have had a chance to grow back. Threvul's first name is spelled "Thervul" in both the name of his shop and his Editor ID, but it is "Threvul" if you talk to him in person. Just a minor typo by the developers. This page was last modified on 23 November 2018, at 07:28.